In a sea of PC gaming keyboards, it can be very hard to stand out without a gimmick or the weight of major brand name. But sometimes all it takes to get noticed is to get the basics right without wasting time or effort on superfluous features. Cougar chose this path for its Ultimus RGB keyboard, and it’s stronger for doing so. Not only does it get all the basics right, but it does so at a sweet price point. 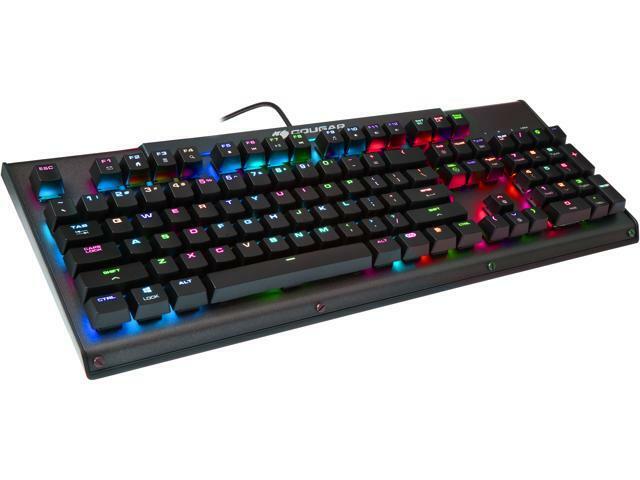 The Cougar Ultimus RGB keyboard is available on Newegg for $79.99. The first thing you’ll notice about the Ultimus RGB is that it’s hefty. It’s one of the heaviest keyboards I’ve ever used, weighing it at a little over two pounds. Cougar took a very direct approach to solving the common problem of keyboards shifting during use. It’s hard for something this weighty to slide around on a surface without some intentional effort. Most of that weight comes from its steel construction. The entire top panel of the keyboard is one solid chunk of steel, with holes milled out for the keys. The rest of the board is sturdily built as well. The parts that are plastic are made of quality material, and the USB cable is braided for extra strength. At maximum brightness, the keyboard looks incredibly vibrant. There are a wide variety of pleasant effects, and the lightning elements themselves support all the primary and secondary colors. The keys also seem plenty durable. Cougar is using their own switches for this deck, but they're roughly equivalent to Cherry Reds. There is one side effect of the steel top plate: If you forcefully bottom out on the downstroke, they keys will produce a subtle metallic clank noise. It’s hard to notice at first, but I eventually found it distracting. If I was going to use the Ultimus as my primary keyboard, I’d definitely consider doing an O-ring mod to cut down on the noise. As one could probably guess from its name, the Ultimus RGB supports RGB functionality. This is great, but Cougar could make more of an effort to clearly explain how RGB functions on this keyboard. It’s entirely possible that when I was trying to figure out this aspect of the Ultimus, my caffeinated beverage of choice hadn’t kicked in yet, but more clarity would be appreciated. I had trouble figuring out how RGB on the Ultimus actually works. Cougar is known for its robust UIX peripheral management software, and other Cougar products I’ve used have demonstrated the care they put into allowing the user to easily customize and control every aspect of their mouse or keyboard. So imagine my surprise and confusion when I found that Cougar has no UIX software for the Ultimus. (UIX packages, while well made, are peripheral-specific.) Finally, by combing Cougar’s website, and the downloadable user guide for the Ultimus, did I figure out that the Ultimus is one of the few Cougar keyboards that does not use a UIX interface. I discovered that the Ultimus RGB uses a less complicated, but also less customizable approach. Using the function key in conjunction with the INS (Insert) key, the keyboard will cycle through a variety of patterns. FN plus the DEL (Delete) key will cycle through the dominant color for a given pattern, and pressing FN then an arrow key will change the overall brightness of all keys. Despite the initially confusing way of changing RGB settings, the effects do look nice. At maximum brightness, the keyboard looks incredibly vibrant. There are a wide variety of pleasant effects, and the lightning elements themselves support all the primary and secondary colors. I settled on a reactive blue scheme. Every time I pressed a key, it would light up blue for a couple of seconds before fading out. Cougar is in the market of making gaming accessories, and the Ultimus RGB is no exception, so how does it actually feel to use? I have to admit my bias here: I’ve used plenty of gaming keyboards, and I simply can’t get used to smooth, non-tactile switches such as Cherry MX Reds or MX Blacks. I much prefer the tactile sensation of MX Blues or MX Browns, be it for gaming or typing. It looks like Cougar is using it’s own proprietary switches. Cougar seems to be using roughly the same scheme as Cherry does for its switches, in regards to different types. The keyboard on-hand for this review has Cougar’s red switches, which feel so much like MX Reds that there was initially a little confusion about what the keyboard was built with. If you prefer that tactile, clicky sensation you’re in luck! The Ultimus RGB is also offered with blue switches that will give you what you’re looking for. Still, as mechanical switches go, you can tell that Cougar’s proprietary switches get the job done. They travel smoothly and don’t make any noise until they bottom-out on the keyboard’s frame. As was already said, because of the Ultimus’ weight, (combined with the normal rubber feet you’d see on any gaming keyboard) it’s really hard to get it to slide around, even during lots of heavy key-presses. The most impressive thing about the Cougar Ultimus RGB gaming keyboard is its value-to-price ratio. For 80 bucks you get an incredibly sturdy, durable keyboard that was obviously built for high-intensity gaming sessions. Nice switches and RGB capability round out an attractive package. The RGB features do leave a little to be desired in terms of customization, but what’s there is diverse and looks great. Plus, at a cost this low, having the amount of RGB functionality the Ultimus RGB does have is impressive. For a all-around well built gaming keyboard that offers a little taste of some top-end features, the Cougar Ultimus RGB keyboard is an attractive contender for the gamer on a budget. You can get your Cougar Ultimus RGB for $79.99.